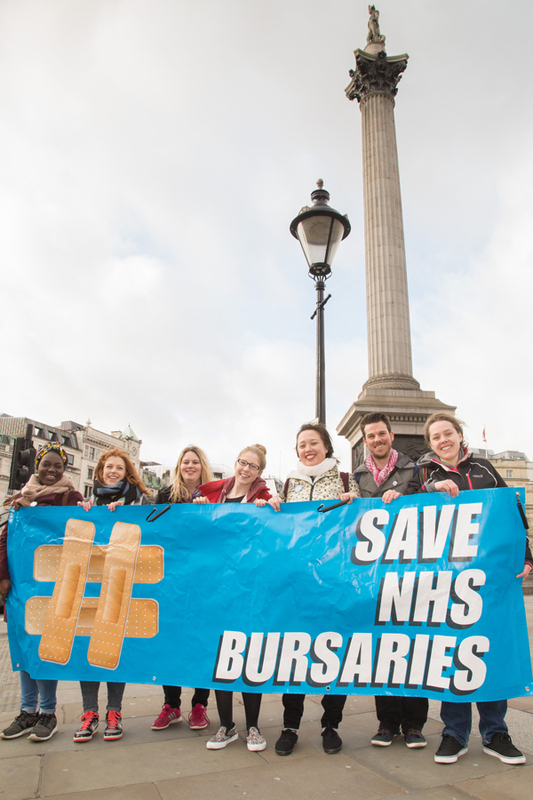 Nursing students marched with banners to iconic locations in London today, promoting their fight to keep the nursing bursary. They are battling the government’s plan to scrap the bursary and replace it with a loan system, which they argue will saddle future nurses with crippling debts. To kick off a week of action, the students gathered at famous statues in the capital today, including the lions in Trafalgar Square, and the memorial to heroic first world war nurse Edith Cavell in St Martin's Place. Similar action took place in other cities including Cardiff, Liverpool and Manchester. Students from London South Bank University and King's College London took part in the protest in the capital. Despite heavy rain and strong winds, they marched from the Old Bailey to the Florence Nightingale statue in Waterloo Place. Second year nursing student Helen Corry admitted the weather had made the day an 'endurance test', but still hailed it as a success. She added: 'We handed out leaflets to the public along the way, many of whom said they supported us in our fight. The government wants to scrap the bursary from September 2017. It says this would save £1.2 billion a year and fund up to 10,000 new training places. 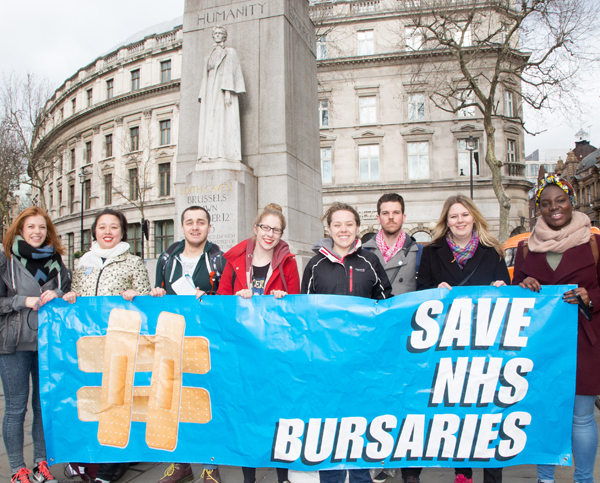 The RCN announced today that it is meeting with other unions to discuss a joint response to the bursary plan. On Wednesday students are due to walk out from their placements or studies for an hour, a move that will also show solidarity with junior doctors who are planning a strike on the same day. Click here for details of the week of action.